Share the tradition that is a Brandywine Christmas. Brandywine Christmas is the most wonderful time of the year at the Brandywine River Museum of Art! 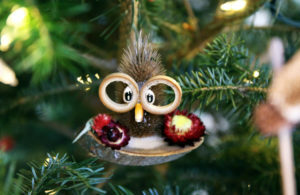 Spanning decades, this annual holiday tradition for all ages features a gallery filled with an expansive model train display, towering trees decorated with whimsical Critter ornaments and lights, plus a wide selection of holiday events and programs for the whole family to enjoy. 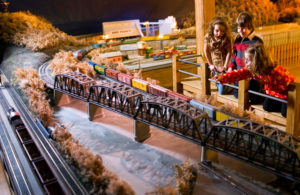 Of special note is the Brandywine Railroad O-gauge model train display (see photo above), a holiday family favorite since 1972. Each year, new operating trains are added to nearly 2,000 feet of track, plus new interactive and visual elements for visitors to discover and enjoy. More than a thousand detailed pieces are featured in the display, including locomotives, passenger and freight trains, and trolleys that pass through a small town, a farm, factories, a drive-in movie theater and even a carnival. New to this year’s Brandywine Christmas offerings, is a special exhibition, “Holidays & Snowdays: Illustrations for Three Children’s Books,” adding a colorful twist to seasonal favorites. 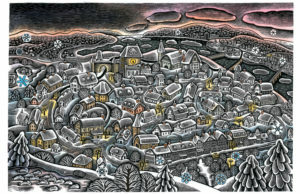 Inspired by those delightfully illustrated stories we enjoy this time of the year, “Holidays & Snowdays” presents a selection of work by three highly talented artists—Beth Krommes, James Ransome and Matthew Trueman—who have recently envisioned additions to the children’s library of seasonal classics. 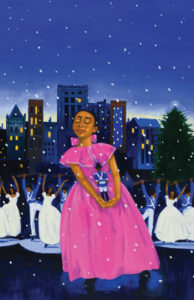 James Ransome, winner of the Coretta Scott King Illustrator Award, sets a traditional holiday story in the jazz-inspired Harlem of the 1920s with his illustrations for The Nutcracker in Harlem by T. E. McMorrow. Working with collage and mixed mediums, and using saturated colors that almost seem to sing on the page, Ransome evokes the sheer pleasure and energy of dance, music and theater. 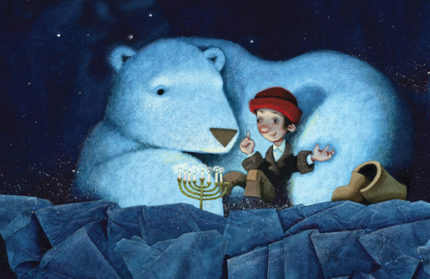 Matthew Trueman depicts an unlikely twosome—a young immigrant and a polar bear—to illustrate the spirit of Hanukkah in Simon and the Bear, a Hanukkah Tale, written by Eric A. Kimmel. Working with mixed media, crushed paper and collage techniques, Trueman brings rich colors and textures to this age-old tale of miracles, wonder and awe. Brandywine Christmas is a glorious celebration of color and cheer for audiences of all ages to enjoy during the holiday season. The Polar Express Read-Aloud Pajama Night, 7 to 8 p.m. Thurs., 5 to 9 p.m.
Fri.–Sun. , 9:30 a.m. to 5 p.m.